This pawHut rabbit hutch is a great addition to anyone who keeps rabbits or any other small animals. It provides a great place for your pets to rest in the upper box and for play can use the ramp to move down to the mesh area. There they can exercise and feed with the security they need from predators. The hutch is made from Fir wood and is ideal for outdoor environments, this will be a great home for your pets is a safe and secure area. 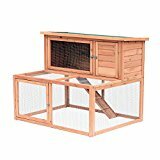 This entry was posted in Small Animals and tagged Animal, Backyard, Cage, Chicken, Coop, Garden, House, HUTCH, Large, Outdoor, PawHut, Play, RABBIT, Ramp, Tier, Wooden by One Boutique. Bookmark the permalink.